Coloured by : Alex Sinclair, Gabe Eltaeb, John Kalisz, Michelle Madsen, Andrew Dalhouse, Romulo Fajardo Jr. There is a small but vocal group of comic readers who are quick to point out the flaws in a timeline for any given character, or some nugget of a half-truth that contradicts a (much) earlier established “fact.” Such “continuity creeps” will lose their mind’s over the latest issue of Harley Quinn. 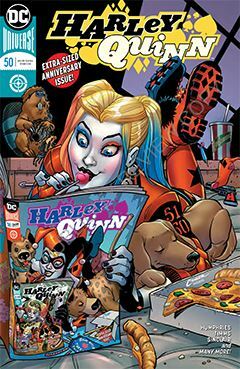 In the story, Harley and her mom peruse a comic book about Harley, only to fall victim to a calamity of epic proportions. All manner of ret-cons and reboots abound, as Harley and her new pal, Jonni DC, chase the comic book through the ever-evolving landscape of the DC Multiverse. The story makes fun of some of the infamous re-inventions and re-imaginings of the past 80 years. Homage – or ridicule, depending on your perspective – is paid to many long-dormant properties. It’s insane, and ludicrous, and just the kind of madness that lives in Harley’s head. It takes a lot of art to get this crazy. Fortunately, the extra-sized book also features a roster of artists to illustrate each vignette, many of which are two-page spreads. My only complaint is that between the ongoing Harley Quinn series, and the occasional special (last week’s Harley Quinn and Gossamer comes to mind), it feels like I’ve been “riding my Haley” every week. Too much of a good thing is a bad thing, And now that the book has reached its 50th issue, perhaps it’s time for DC Comics to dial it back to a monthly.